I’m teaming up with Caroline from Organize Nashville and 27 other bloggers to share our Christmas decorating ideas in the Simply Seasonal: Holiday Edition blog hop! We are opening our doors to give you a glimpse at how we decorate for Christmas and make the season merry and bright. 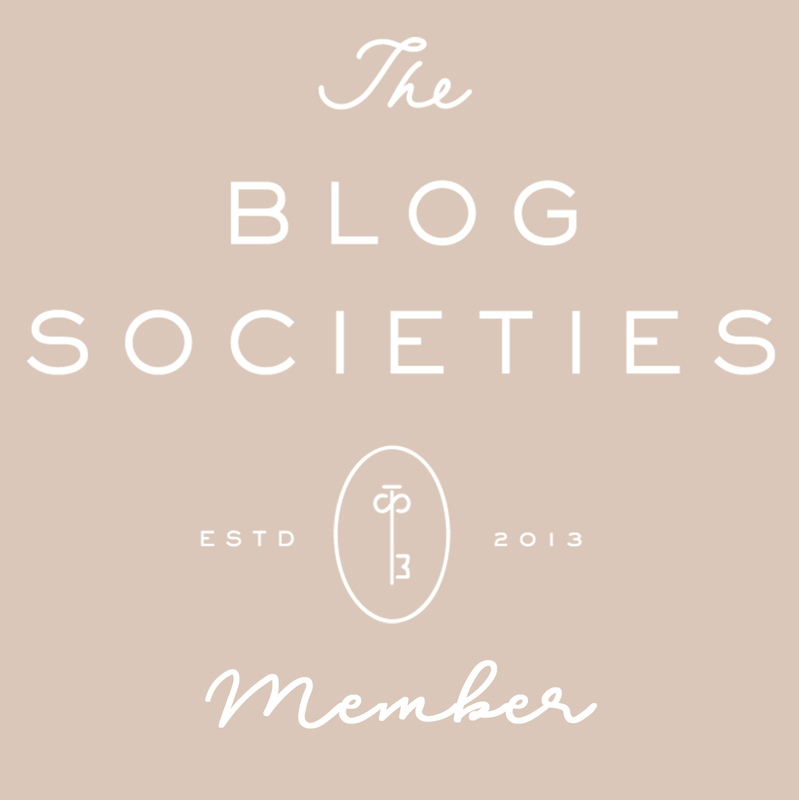 I’ve listed links to the other participating bloggers at the bottom of this post. I’ll be sharing tips to add that special Southern charm to your Christmas decor and give you a peak inside my Southern Christmas home. If you’ve just come over from Roots North & South welcome! Don’t you love her snowman themed tree? This is S.’s and my first Christmas in our new house in Tennessee. It’s been especially fun to try our Christmas decorations in new spaces, and I can’t tell you how excited I am to have two fireplace mantles to decorate. I’m sharing the mantle in our formal living room today. We are still in renovation mode here, so none of the rooms are totally done or decorated, but we have come a long way. Take a look back at the house when we first moved in here. Christmas in the South is truly unique marked by long standing traditions and an abundance of Christmas cheer displayed for all to see. If you are lucky enough to be a Southerner or have spent a Christmas in the South, you know this to be true. We love our Christmas light displays, a wreath on the door (and more often than not every window), a poinsettia in every room, and the nativity set in a most prominent position. Sure not every Southern family celebrates Christmas the same way, but as the first region to celebrate Christmas in the United States, I think we Southerners feel a special commitment to make the holiday bright and meaningful. You can never have too many Christmas trees. This is a fact universally recognized across the South. 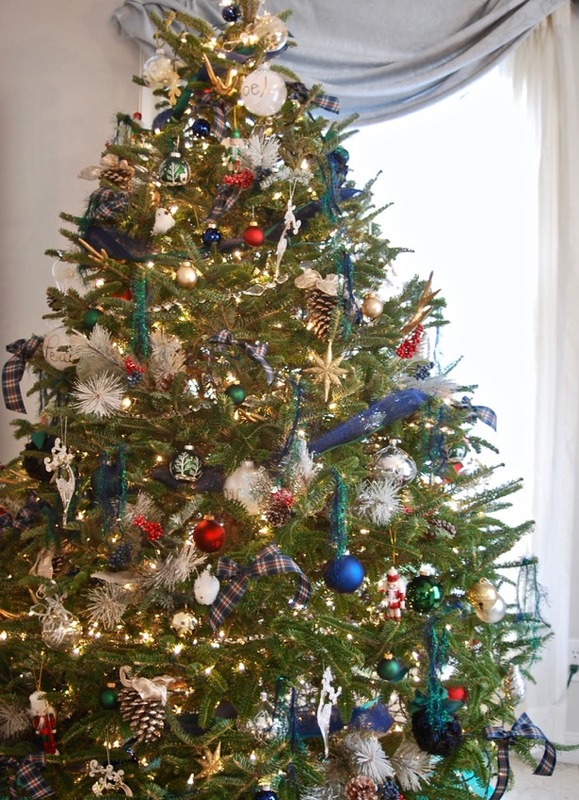 It doesn’t matter if the trees are 12 foot tall or table-top size, more than one Christmas tree is a must in a Southern Christmas home. 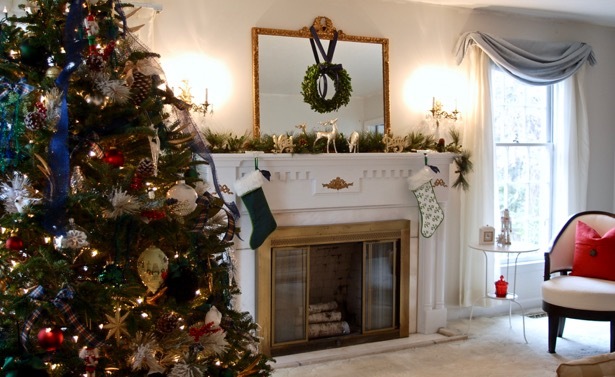 Use greenery to adorn mantles, stair rails, columns, and just about anything that will stand still long enough for you to drape it over. Live or preserved greenery is preferred, but you can use artificial if it’s a last resort. Be sure to mix your evergreen boughs with classic Southern plants like boxwood and magnolia. Bring on the flowers with planters of paper whites, amayrillas, and poinsettias. If you are feeling particularly ingenious, you can even make a Christmas tree out of poinsettias. Citrus fruit is appropriate for decoration and stocking stuffers. Citrus fruit use to be a rare and prized commodity in the South usually arriving from tropical ports in the winter months, so many Southerners gave oranges as gifts and treasured this once a year treat. This tradition continues although many kids aren’t quite sure why. 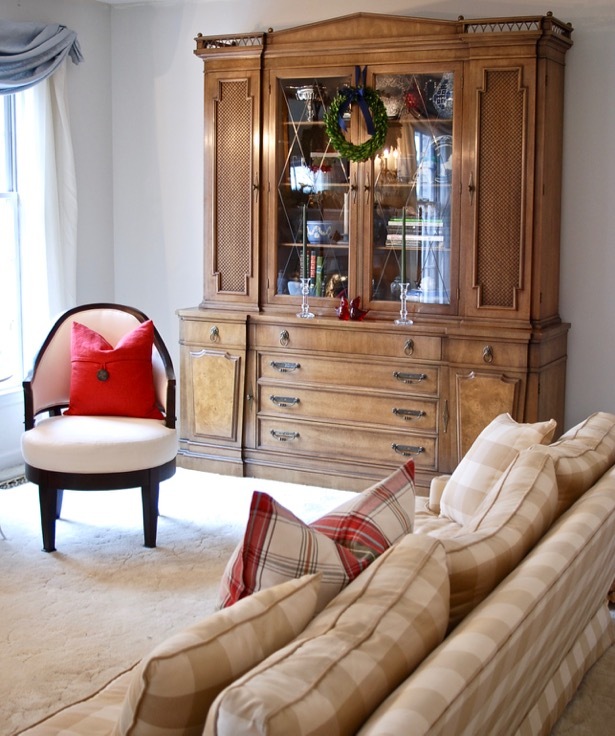 Add a touch of Christmas whimsy even if you are a traditionalist. Your whimsical element can be more subdued like the velvet bow on my spaniel statuette or you can channel your inner Steel Magnolia with a wreath bedecked by baby Jesuses. 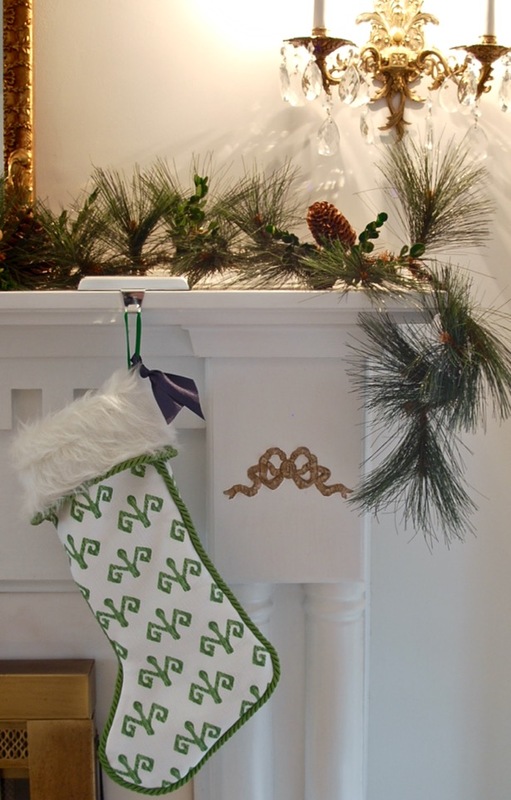 I’ve incorporated many of the above Southern Christmas decorating tips in my home. I do every year mostly subconsciously because this is how my mother and her mother before her decorated their homes – it’s Southern tradition. 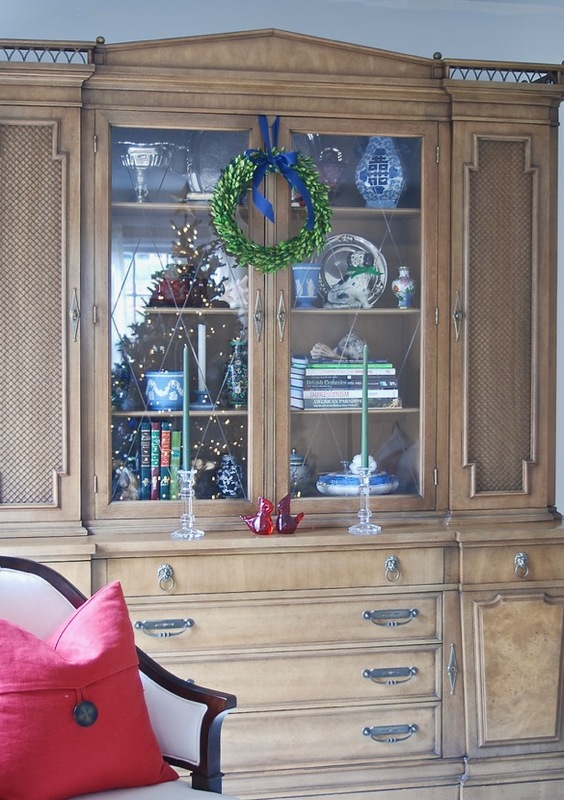 For this blog hop I’m mainly showing you my formal living room all decked out in Southern Christmas cheer, but stay tuned for my Christmas front door and tablescapes. 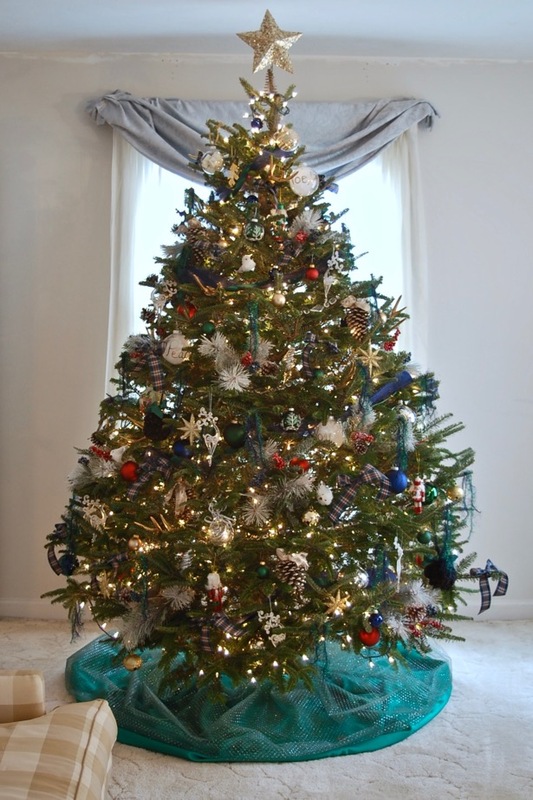 This year I did mix it up a bit going with a blue and green color scheme and an elegant plaid ribbon. I hope you enjoy my Southern Christmas home! I made these boxwood wreaths! Click to read the tutorial! I’m sharing how to pick the perfect Christmas tree and keep it healthy throughout the holiday season here. Loving my blue, green & plaid Christmas look? Check out my shopping guide! I just bought and painted this rattan bar cart before Thanksgiving, and I am loving styling it and mixing cocktails. See the DIY here! I’m sharing the rest of my dining room all decked out for the holidays in this post about hosting a charming holiday brunch. Head on over to Organize & Decorate Everything for the next Christmas home tour on the Simply Seasonal blog hop. LOVE the bar cart! I’m a huge navy/green fan, and in the past that has always been my Christmas color palette, too. So, I loved seeing that color scheme in your home! Your tree is beautiful! I love all of the blue and green details! Just gorgeous. Thanks Caroline! 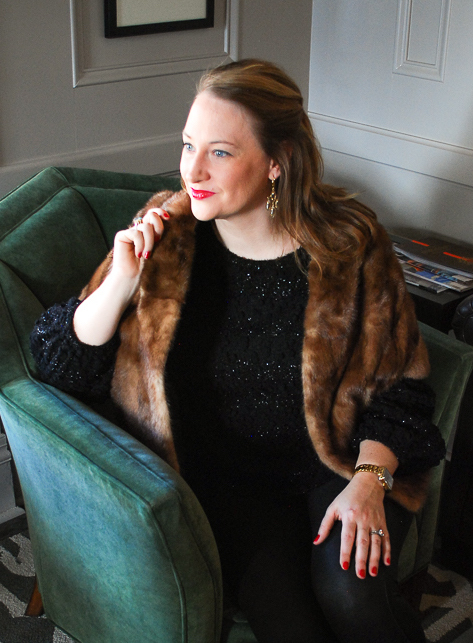 I’m loving your winter wonderland over on Organize Nashville! Wow!!! I absolutely love your home!!! Gorgeous!! And that Barcart is just fabulous. Merry Christmas. Gorgeous color blue and its such a beautiful home, the boxwood wreaths are so elegant. I’m obsessed with this blue! The wreaths were easily made too. Thanks Maria. I love your tree and that navy bar cart! Beautiful home! 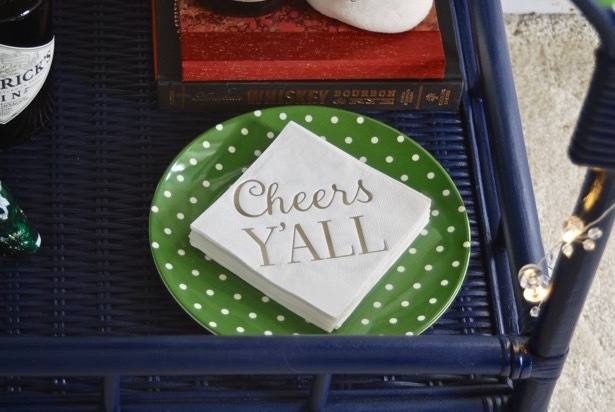 These southern girls love your southern decor! Merry Christmas! Thanks ladies! Merry, Merry Christmas! I love your beautiful southern home. I live in Alabama and totally laughed and nodded about the christmas tree thing. I have 3 larger ones and then 4 smaller ones and I still want more. Your home is beautiful. I love all the blue and gold. Your home is beautifully decorated for the holidays. 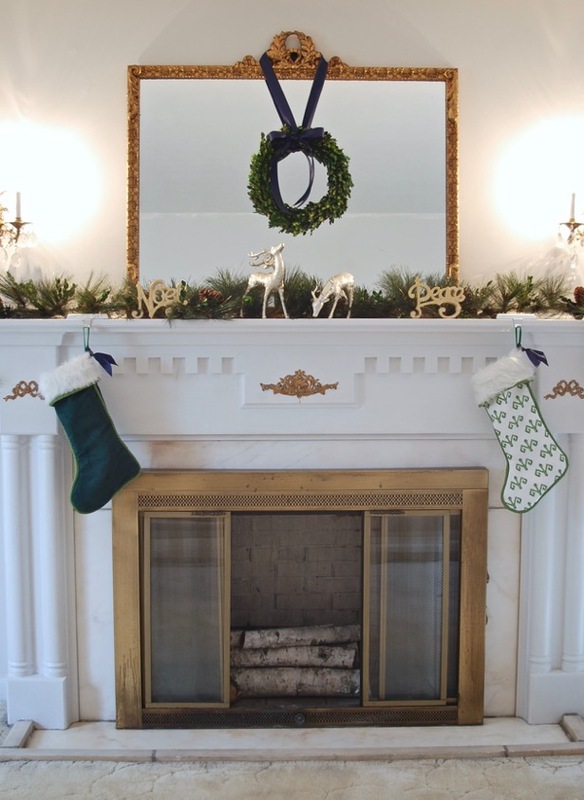 And lucky you to have 2 mantels to decorate! Merry Christmas! Thanks Leanne! I’m feeling blessed indeed. Merry Christmas! Beautiful home! I love the colors and that bar cart is adorable :). Thank you for sharing, I’m pinning! Thanks April! I appreciate it! Your house is so pretty! 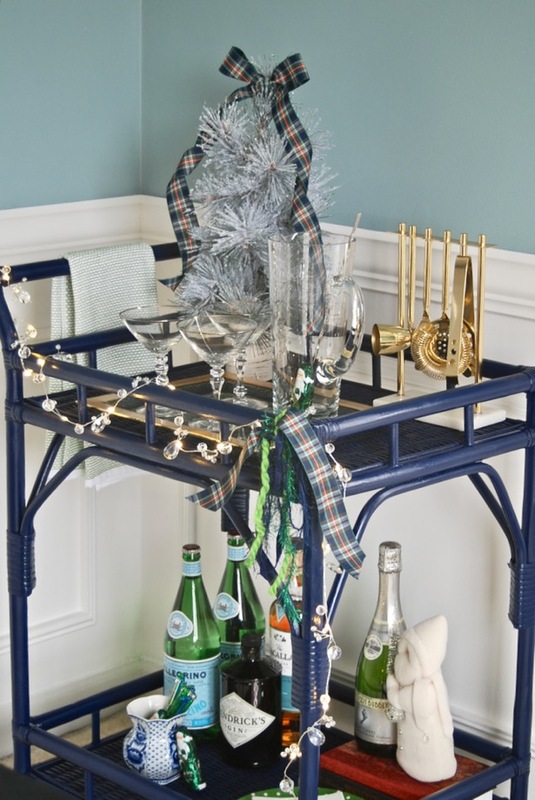 I love that bar cart and the boxwood wreaths, can’t believe you made them! Happy holidays! Merry Christmas! 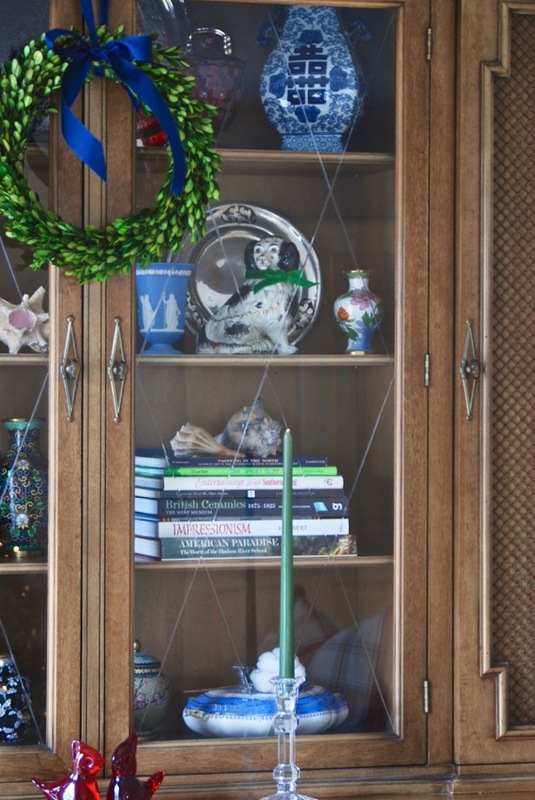 I did – the wreaths were easy to make although it did take some prep work to preserve the boxwood. Southern style! Love your boxwood wreaths! Merry Christmas! I’m so glad you like it Julie! Merry Christmas! 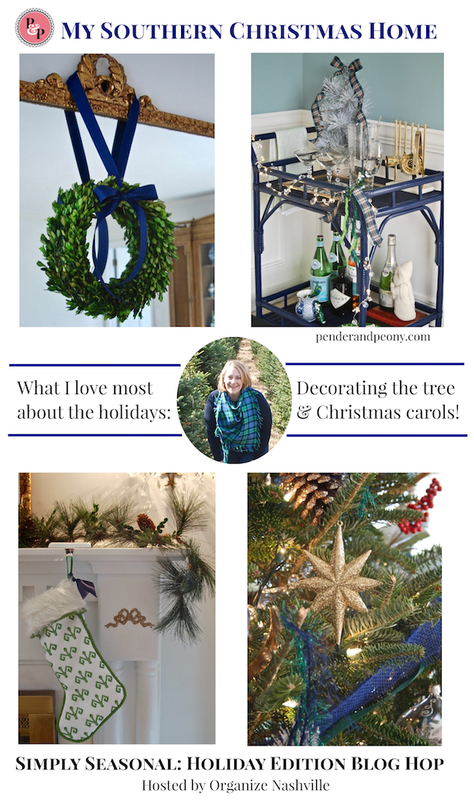 I’ve never thought about decorating for Christmas with such a rich blue color…until now!!!! So happy I’ve inspired you! Happy Holidays! I just loved your Holiday Home Tour! The pops of blue are gorgeous & really stand out! Beautiful! Yay! So glad you liked it Michelle. I looooove your color scheme!! Perfect for the holiday. I’m so happy that you joined the hop! XO Pinned and Shared! Thanks Danielle! It was a great holiday hop! You have a beautiful home, and that bar cart is fantastic! I love how you’ve decked it out for the holidays! I’m in love with the bar cart too! Thanks for visiting! I’m drooling over that mantle with that GORGEOUS mirror. The wreath on it is the perfect finishing touch. Your home is BEAUTIFUL! I picked that mirror up at an antique shop for next to nothing because the mirror part was damaged. Some new glass and voila – mirror perfection! Merry Christmas! The decoration is beautiful. I’ve lived in the south for some time and seen the beautiful homes! Your home is stunning! 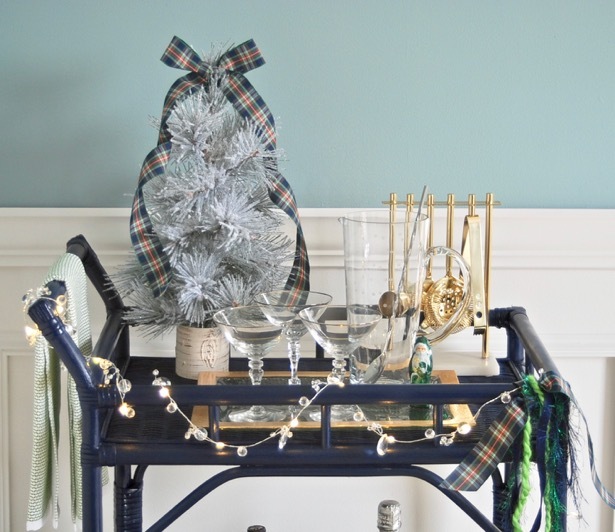 Love the color scheme – the tree and bar cart!! Thanks Zan! I love Christmas in the South! 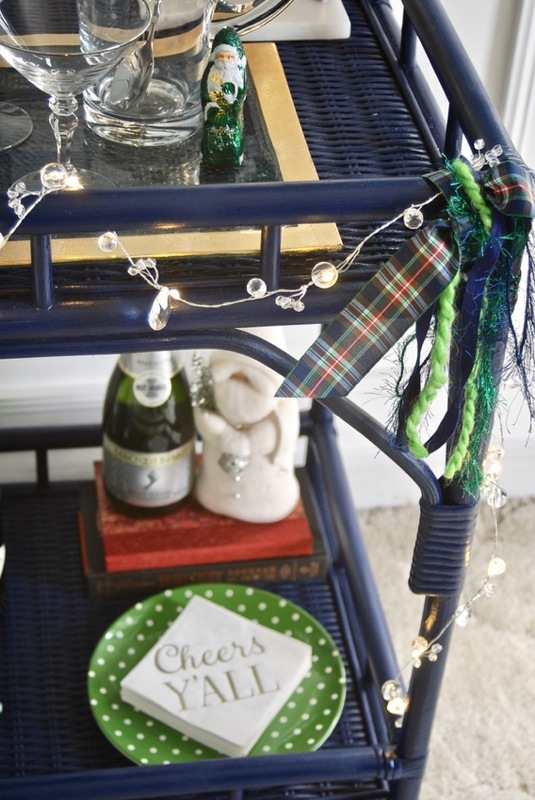 I love your lovely blue touches on the wreath, bar cart, and tree! So pretty! Thanks so much Lisa! It is such an easy color to decorate because it goes with almost everything! Happy Holidays! Your home looks gorgeous all decked out for Christmas! 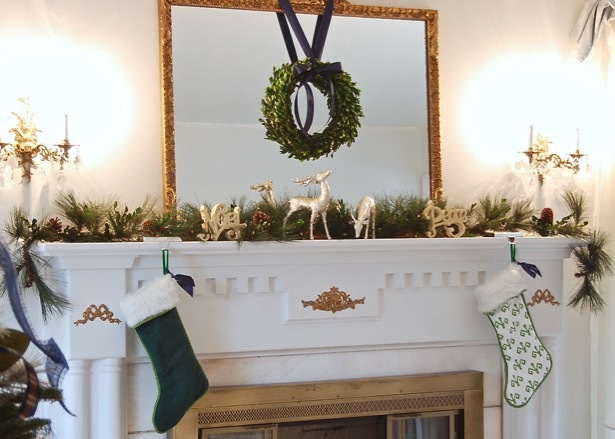 Your stockings and boxwood wreaths are my favorite!